(Nanowerk News) A review published in IEEE Transactions on Magnetics ("Prospect for Antiferromagnetic Spintronics") compiles the approaches that have been employed for reading and storing information in antiferromagnets and answers the question about how to write on antiferromagnetics successfully. Dr Xavi Martí and Dr Ignasi Fina, together with Tomas Jungwirth from the Institute of Physics ASCR in Prague, are the authors of the review. Antiferromagnetic materials might become a more robust alternative to ferromagnetic materials which make possible today’s BITs of digital information. Dr Xavi Marti and Dr Ignasi Fina have released an article, together with Tomas Jungwirth from the Institute of Physics ASCR in Prague, where they review approaches that have been employed for reading, writing, and storing information in antiferromagnets. Ferromagnetic materials are made by very small compasses all pointing to the same direction. These can be manipulated by the application of an external magnetic field, which can define a preferential direction, for example “north-south” or “south-north”. These “north-south” or “south-north” aligned small compasses are the magnetic information unit, the BIT for credit cards, transport cards, hard disks, etc. In all these cases, if a sufficiently strong magnet is approached to any of these memories, its contents will be erased and it will be impossible to recover the stored information. 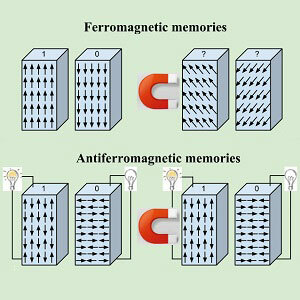 Instead, and particularly appealing in terms of robustness, are the antiferromagnetic memories – still in a development stage. In antiferromagnetic materials, the small compasses (magnetic moments) point alternatively in antiparallel directions. This arrangement can hardly be manipulated by external magnetic fields thus delivering a significant shielded against electromagnetic perturbations. The key point to store information is that, unlike the “north” or “south” in ferromagnets, in antiferromagnetic materials the units of information are arranged either “north-south” or “east-west”. The key question is how to write such “north-south” or “east-west” bits if they cannot be easily manipulated by magnetic fields? The answer to this question is given in the recent short review paper mentioned above. In this work, a list of the strategies for writing antiferromagnets is given. Being the writing method a significant bottle-neck for transferring the research on antiferromagnetic memories to the industry, this work is of the interest for the antiferromagnetic spintronics community and a valuable guide for researching potential applications.